The biggest reason why a lot of people spending hundreds of dollars on garage door repair is because they neglect their garage doors on a regular basis. Every day they open and close it whenever they leave their homes, and again once they return from wherever they’re from, but most won’t even think twice about doing regular maintenance work on them. General cleaning Your garage door is susceptible to the elements, and it’s not surprising that debris, dust and other particles can accumulate in the tracks and hinges, preventing your doors from opening and closing fully. This can be prevented simply by cleaning the hinges, tracks and other parts of the garage door regularly. When you hear a noise when your door opens, it’s probably because something is stuck in the tracks. Lubrication Aside from dust and debris, your tracks and hinges are also vulnerable to rusting and deformities. Each time your garage door opens and closes, the parts sometimes scrape together, and in some cases, the edges become sharp, jagged and deformed. To keep things running smoothly, make it a point to oil the hinges, tracks and coils of your garage door every now and then. Not only does this make your garage door more efficient, it also lengthens the lifespan of its parts. Wiring check If you’re using an automated garage door opener, you may need to check on the system every once in a while. This is especially true in cases when you notice that the doors are opening slower than before, or if it stops suddenly every now and then. Check the fuse, circuit breaker, motor and cables to see if they’re in good working condition. If your door is still opening and closing slowly, check the springs to see if they can bear the weight of the garage door panels. Although there are many things you can do on your own, it’s still probably a good idea to have a garage door technician on-call to conduct professional maintenance on your garage doors every now and then. While this may seem like an added cost on your side, it’s still way cheaper than having to pay for a repairman when your garage door breaks. Maintenance work requires a bit of attention, care and maybe even money. However, it is still a better option compared to shelling out a lot of money in the future when your garage door gives you problems simply because you didn’t take proper care of it. Garage Door Repair Simi Valley an excellent company to know about if you have a new set of garage doors. They offer their customers a complete garage door service from start to finish. 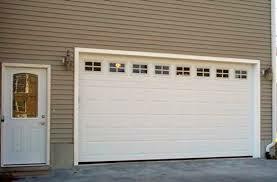 They are experienced in all types of garage doors. Their staff and installers will make sure that you have a memorable experience. They have a reputation for taken care of all their work in a proper and timely manner. If you are adding a new garage to your home, their friendly sales staff will show you the latest and most popular styles. Everything will be explained to you in detail. This will provide you with the confidence that you have made a wide decision in choosing Garage Door Repair Simi Valley. One of the things that Garage Door Repair Simi Valley will stress to you is to have a regular inspection and maintenance done every year on your new garage doors. It does not matter what type of garage doors you have. They can be a chain-drive, a belt-drive, or screw drive door opening system. All garage doors require a yearly lubrication to ensure their smooth operation. Some of the simple maintenance duties that a homeowner will want to have done is to inspect the tracks and look for any debris that will hinder the rollers from rolling smoothly. If here is debris, simply wipe it out with a damp cloth or use a vacuum if necessary. A key maintenance tip is to lubricate the doors rollers with a 10-30 engine oil. Place a drop or two on each roller. Then roll the door up and down so the oil penetrates into the rollers bearings. Never use grease. Grease will collects debris and will gum up the track. A few simple maintenance tricks will keep your doors rolling along for years.